The natural pattern of uptake of minerals such as Potassium (K), Magnesium (Mg), Sodium (Na) and Calcium (Ca) varies during the course of the growing season. 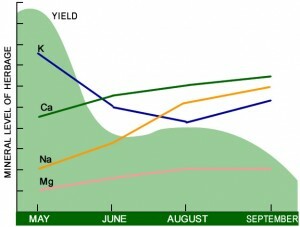 The dry matter of young rapidly growing grass, especially in the spring, has a high K content which declines as the season progresses, whilst the concentration of other minerals increases through the summer. This is in line with the needs of grass which for optimum growth requires large amounts of potassium and lesser amounts of magnesium and sodium. 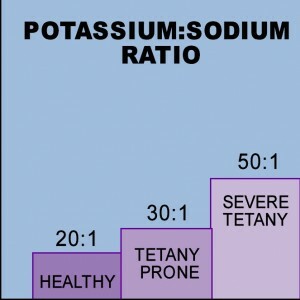 For animals however, the balance of requirements is for more magnesium and sodium and only modest potassium. An adequate supply and balance of these minerals is important to minimise the risk of metabolic disorders such as hypomagnesaemia (staggers or grass tetany) and milk fever and to ensure fertility. Increasing uptake of one nutrient by the plant may affect the level of others, but it is quite wrong to assume that the application of potash automatically leads to mineral disorders. The effect of potash fertiliser on herbage mineral content will vary widely in different situations. 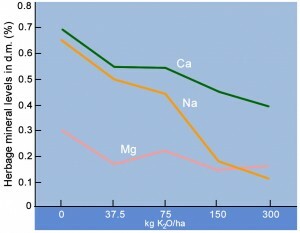 The graph below shows how magnesium and sodium % may decrease as a result of potash application. 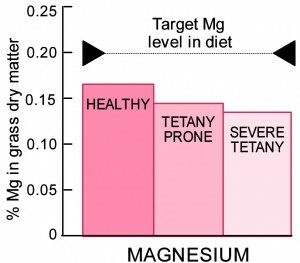 However this is not always the case and the application of potash may not have any effect on the sodium or magnesium %. 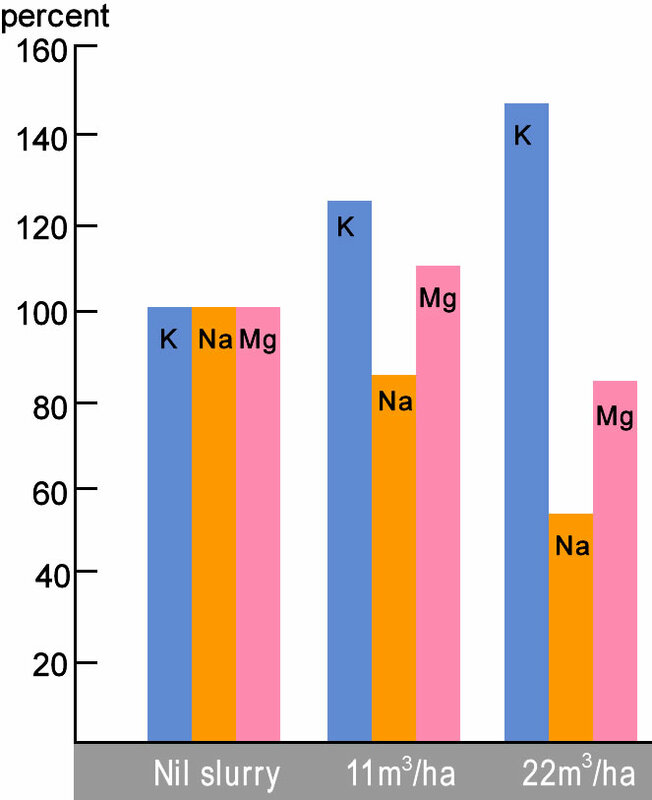 Magnesium % in grass on the sandy soil was progressively reduced by higher spring potash applications whereas magnesium levels in grass on the clay loam were unchanged even up to 200 kg/ha K2O. On farms where staggers is a recurring problem, attention should be given to the potassium, magnesium and sodium content of herbage. Normal magnesium concentrations in herbage are frequently below the minimum 0.20% suggested for animal diets. Magnesium % in plants is affected by a large number of factors and whilst the risk of magnesium disorders may increase with lower herbage magnesium, this is not a reliable measure of whether clinical mineral problems will occur in the animal. The level of sodium should also be considered. 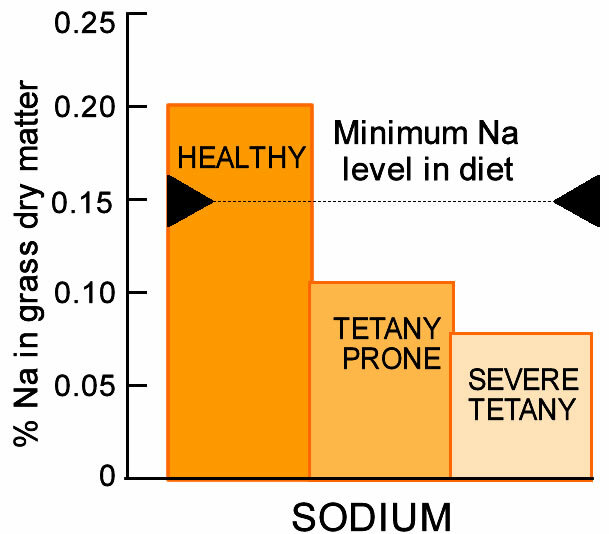 The bar chart above shows that where herbage sodium levels are above the minimum dietary guide of 0.15% Na, the risk of staggers is low, but rises with lower sodium levels. 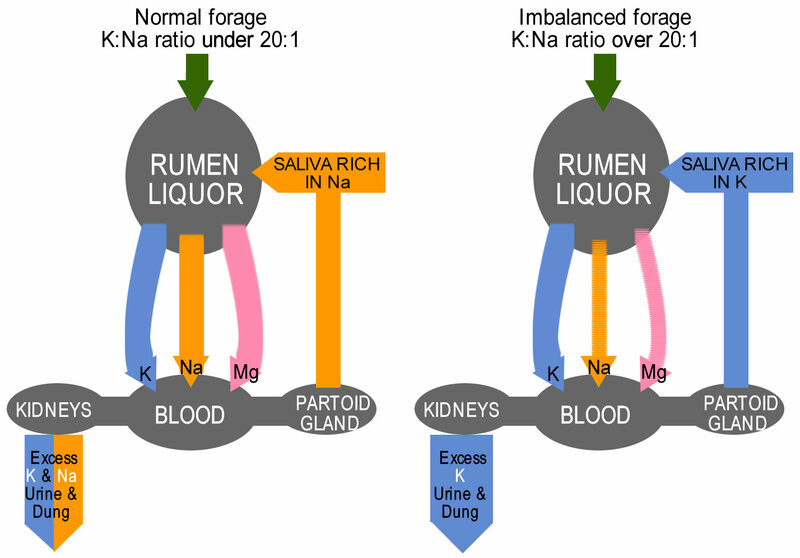 Nutrient balance is important in avoiding mineral disorders and experimental work has shown that there is less risk of staggers when potassium, magnesium and sodium levels in herbage result in K:Na and K:Mg ratios of between 10 and 20:1. The histogram indicates the greater risk of staggers at K:Na ratios greater than 20:1. Field trials and surveys have shown that maintaining a high level of sodium and magnesium in grass will reduce the risk of staggers. 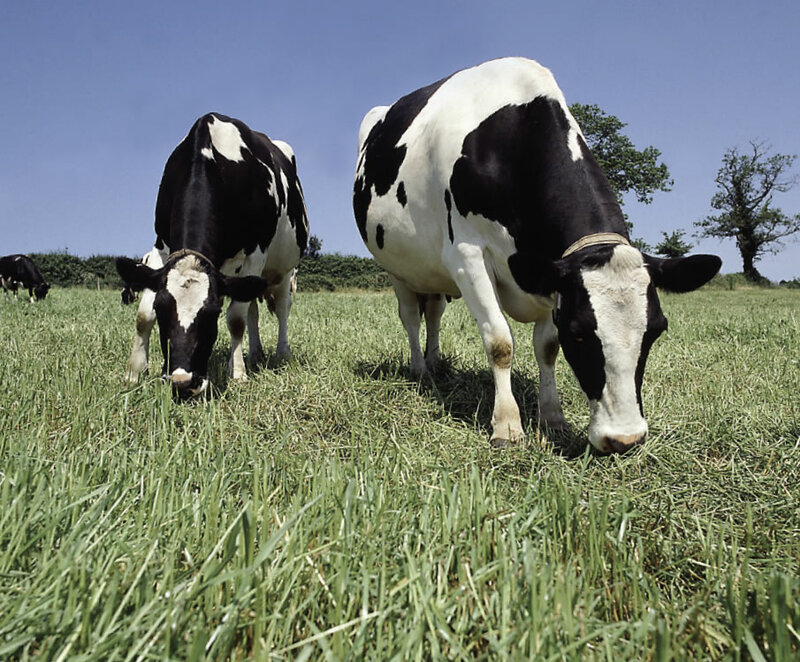 Sodium fertilisers will not normally give extra grass yield but they will increase the Na content of grass which will improve the palatability of herbage and may reduce the chance of grass staggers. Sodium is also associated with a greater % of live herbage, higher D values and sugar content of grass. Research from Bangor University indicates that these effects increase milk output and % butterfat and may also have a small benefit on somatic cell count. Grass palatability and milk output increase at herbage sodium levels up to 0.5% in the dry matter. Staggers is mainly associated with lush spring growth when magnesium and sodium % are low, potash application to grazed swards should be avoided at this time. Replacement K dressings should therefore either be made after the spring flush ie. June onwards, or applied in small more frequent applications. Potash requirements of grazed grass are small because most K is recycled back to the sward in the dung and particularly in the urine. Staggers can occur at other times in the season when magnesium levels are inherently low, where over-dependence is placed on low dry matter grass and when animals are under other stress such as at calving. Close attention to the mineral nutrition of animals is required at these times and supplementation may be required. Silage and hay crops remove large quantities of potash from the soil. These must be replaced to maintain soil fertility and protect future yields. Restricted use of potash will seriously reduce hay and silage yields and will not necessarily reduce the incidence of magnesium disorders. Much of the sodium consumed by cattle and sheep is used in the production of saliva which is secreted into the rumen to maintain a constant pH by neutralising acids formed by bacteria in the rumen liquor. 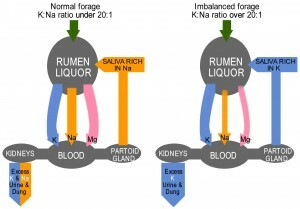 If the sodium content of forage is too low, the animal automatically substitutes potassium for sodium as an alternative buffer in the saliva and diverts sodium to maintain blood Na level as first priority. The resulting increase in K:Na ratio in the rumen leads to reduced resorption of Mg through the rumen wall into the blood – hence placing the animal at risk to hypomagnesaemia. However, it is only in extreme cases that a low blood level of magnesium occurs (less than 1.8mg/100ml of blood in cows) and the consequences of the condition (reduced milk yield and even death) may arise without ever detecting low blood Mg. 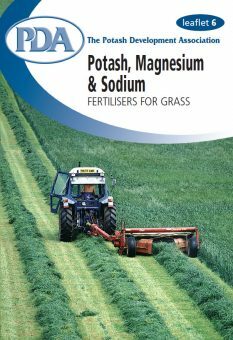 The sodium and magnesium content of grassland can be improved by using sodium and magnesium fertilisers to balance the levels of K required for grass production. A list of fertilisers containing potassium, magnesium or sodium is given below. Extra minerals may be required for high yielding dairy cows and lactating sheep. Feed analysis should be used to confirm supplements required. Slurry is a valuable source of minerals containing a little sodium, some magnesium and a lot of potash. Modest applications of slurry may increase K and Mg levels in herbage. 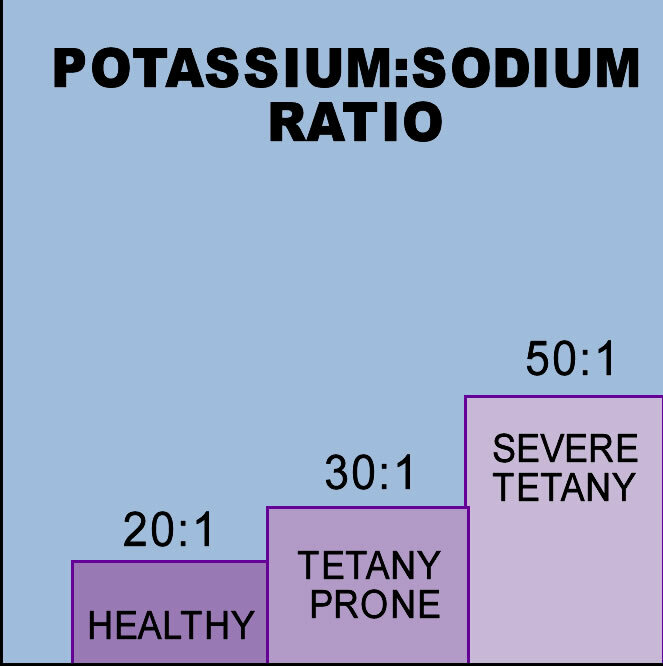 With larger applications however, the high concentrations of potassium tend to depress both Na and Mg levels. The nutrient contribution of slurry should be taken into account when deciding fertiliser policy. In particular, spring potash dressings should be adjusted when slurry has been applied over winter to avoid excess levels of K being available to the grass in the spring. Soil sample every 4-5 years to check on fertility status and trends. Where mineral disorders are a problem take herbage samples when grass is growing actively (eg May) to check on K, Mg and Na status. See PDA leaflet 14 Potash for Grassland & the PDA Grassland Kalculator for detailed recommendations. Recommended rates of potash for grazed grass are 60kg/ha and 30kg/ha of K2O for soil index 0 and 1 respectively. For soils with higher soil fertility levels no potash required. Very large quantities of potash are removed in grass silage which must be replaced to maintain soil fertility and yield potential. The following is guide to typical potash offtakes from multi-cut silage systems. Apply up to 80-90 Kg K2O/ha for each cut according to soil analysis. Make allowance for potash contribution of slurry or manure used. Where larger amounts of potash are required to improve soil reserves additional potash should be applied in the autumn/winter. Low soil magnesium levels will affect grass yield as well as mineral balance in the animal. Apply 50-100 kg/ha MgO every three to four years at Mg index 0. Yield response is less certain at index 1 but magnesium application is justified in terms of insurance for grass yield and mineral balance for the animal, to maintain a soil magnesium index of 2. 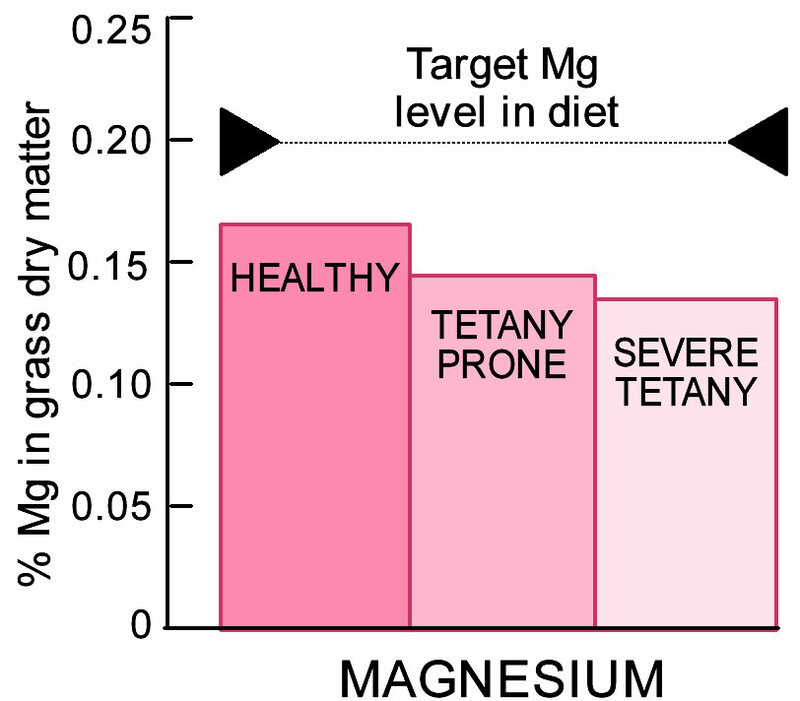 Where lime is required and Mg levels are 0 and 1, use magnesian limestone as the most cost effective magnesium source. Where pH is satisfactory, specific magnesium fertilisers (see table below) should be used for soil improvement. Use water soluble forms of magnesium where rapid plant uptake is required. Epsom salts applied as a foliar spray may be used to help boost magnesium intake by the animal. Alternatively calcined magnesite may be dusted on pastures for direct grazing and ingestion by the animal at critical times. 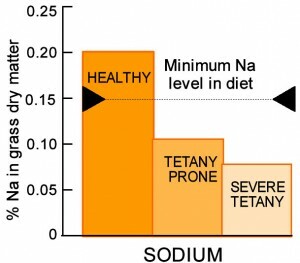 Sodium is very soluble and is rapidly taken up by plants but levels cannot be built up on a long term basis as Na is not firmly held in the soil. Apply up to 140 kg/ha Na2O as an early spring dressing. A split application may be preferable at higher rates. Apply regular dressings of about 10kg/ha Na2O through the season. Levels of potassium, sodium and magnesium as analysed in soil or herbage are expressed in elemental terms i.e. 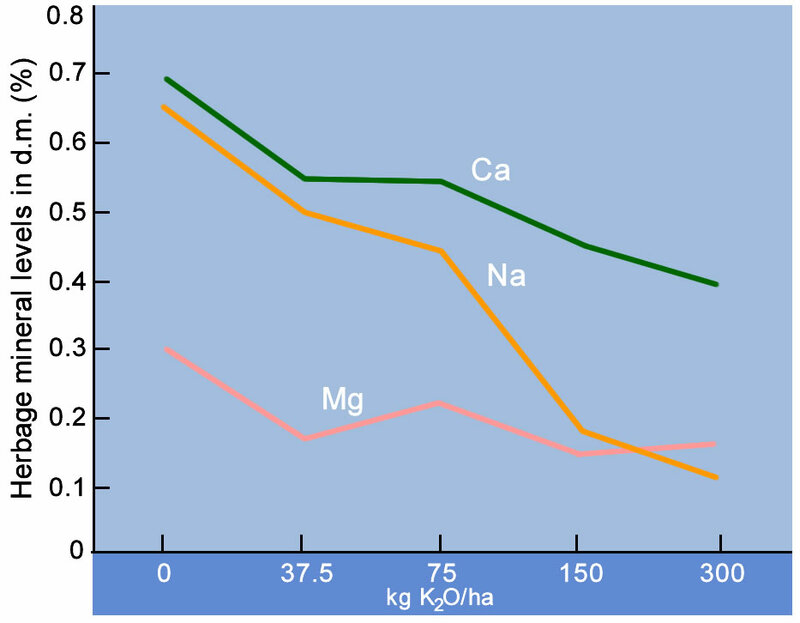 K, Na, Mg.
Nutrient content of fertilisers and application rates of these nutrients to grass are expressed in the oxide form i.e. K2O, Na2O, MgO.